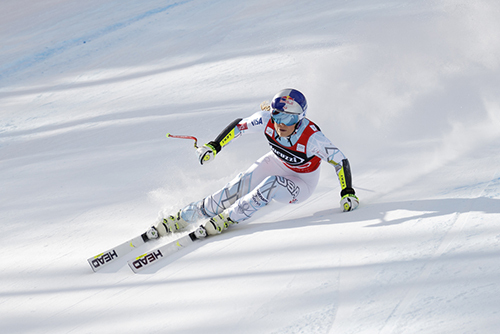 We are all sorry to see that Lindsey Vonn sustained a severe fracture of the humerus (upper arm bone) during a skiing training run. Downhill skiing is an exhilarating sport but not without risk of orthopedic injury, even if not flying down the mountain like Lindey Vonn. Both fractures and dislocations of the arms and legs are common and are frequently what we refer to as “high energy” injuries. That implies a hard fall at notable speed usually on hard packed snow. Bones subjected to high energy break or fracture (both words mean exactly the same thing!) differently than those that occur in a typical minor trip and fall; they shatter into more pieces (termed comminution). Also, the sharp edges of the bone fragments can even poke through the skin (once termed a “compound” fracture but more correctly termed an “open” fracture). Sometimes, significant nerve injuries can occur in association with the high-energy imparted to the injured region. These can usually be treated with observation only but should be fully evaluated. High-energy injuries such as skiing often tear ligaments and cause joint dislocations as well. A joint dislocation is an emergency that needs to be reduced (put back in place) as quickly and safely as possible. A joint dislocation ALWAYS tears some of the ligaments that stabilize the joint. If they do not heal properly, with or without surgery, the joint can be left with residual instability (abnormal and symptomatic movement of joints). Once these injuries, whether fractures or dislocations, have been stabilized (most often in a splint or brace), they are most often no longer emergencies, allowing people to travel back to their homes for definitive treatment. Ideally, these patients will have their surgery performed by their local orthopedic surgeons who can then directly oversee their rehabilitation after surgery. For example, shoulder dislocations that result in labral tears (the rubbery calamari-like suction cup around the shoulder socket) almost never need to be treated urgently surgically, leaving patients plenty of time to return home for treatment by the orthopedic surgeon of their choice. Similarly, ACL (anterior cruciate ligament) tears of the knee are not typically surgical urgencies.